After Kyoto, Osaka was a mega-city with not much traditional charm but a bustling nightlife and food street. It was raining pretty heavily when we arrived, despite that, we headed out to the giant crab and squid fixtures in Donburi and found the takopachi balls that we'd been eyeing the whole trip. The best one was definitely the first stall we came across- fat squidy balls with fresh tasting dough and heaps of garnish, with dashi flakes that fluttered in the wind, weighed down by the drizzled mayonnaise. I managed to do all the street-type eating that didn't get done in hectic Tokyo and which couldn't be found in traditional Kyoto. This was the ramen store, with the traditional vending machine for ramen bowl tickets. The next morning, for breakfast, we went to Song Wu, a chain of Yoshinoya type restaurants (but more declasse). This was also a hole-in-the-wall counter where you had to buy a ticket and squeeze onto a stool (and eat with the Japanese equivalent of construction workers). They had all different kinds of beef bowls that they prepared in their very efficient narrow counter kitchen. A grill for frying meat, a stove with a giant vat for stewed meat and another of sauce, a rice cooker and a fridge for cold salads and fruit, all very tidy and compact. Their beef bowl was yummy...I'm sure it was oily and sitting overnight inside the vat but it was so good! Like a lot of street food in Japan, I found it to be of very decent standard and value! In Osaka, I also finally had time to stop and smell the supermarkets and department stores. Their food halls are marvellous, very expensive again but with tons of snack, biscuit and pastry stands and disturbing Japanese ladies with fixed smiles and pastel uniforms and peaked caps, according to which store they work for. The pastry stands in particular have gorgeous little mont blancs and strawberry shortcakes and cream puffs, just absotely perfect and petite. I oogled at their gigartuan, overpriced fruit and enjoyed the heated, soothing toilet stalls and basins. Truly, a developed, clean society...it's so maniacal yet manicured, it's quite scary. On the last day back in Tokyo, I had of course, to go to Sadaharu Aoki and eat all his green tea pastries. However, I packed them up to go, as that day also contained a surprise, an improptu trip to line up for tickets to Jack Johnson's beachside concert in Yokohama. I never knew that Yokohama was just slightly under an hour away by metro from Tokyo and that they had such a beautiful pierside city. 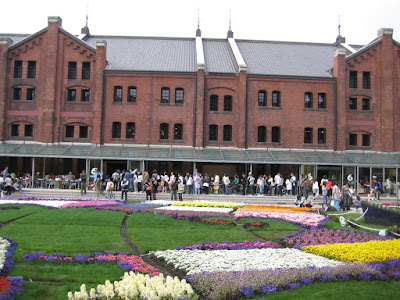 The concert was 6 hours of surfer music, set next to the Red Brick Warehouse and as it turned out, the weather was perfect, the ticket line was short and we were early for a fantastic scene of flowers, ocean and Sadaharu Aoki tea-time pastries! I do like Japan! Kyoto has actually burned down four times, but remains with an gorgeously old and historical feeling and sentiment to the place. There's just something about the colours of Kyoto and it's also quite honestly, what makes it look better in photos, than in real life. One interesting thing that we did in Kyoto was to follow this old guy, Johnny Hillwalker, around on his Kyoto hike. He does this three times a week and brings a whole crowd into personal temples, cemetaries, pottery shops and markets that you wouldn't otherwise see on the tourist trail. It was a really good sightseeing thing to do, though, wow but the old guy walks hard and long! And, the price of the tour was pretty steep, considering he was collecting cash from a huge group of us insight-hungry travellers! This is one of the stalls in the Nishiki market in central Kyoto, it's a largely food-centric market and a lot of the locals come here for their dried and pickled produce. Here they were selling whitebait, which is used in omelletes or to flavour soup! This shop sold only these little fish, just like the shop that only sold their home-ground dashi and the famous knive shop that only sold drool-worthy sashimi knives and copper moulds. This is a specialty tea shop in the market. In the back, you can see the tea roaster, which was grinding at very high temperatures and spitting out buckets of roasted tea. Tea in Japan is an obsession but I think this tea shop, though small and pretty humble, actually had terrific, aromatic tea. They were also very rude and also not that cheap unless you will willing to buy the tea made of tea-stems, rather than leaves! They packed the tea for you in these vacumn-sealed aluminium foil bags and if you are in Kyoto, this is the only tea shop in the market, I highly recommend their gorgeous Genmaicha. It is the most nuanced, layered, yet subtle popcorny flavour I've tasted in ages. I only wish I had been more adventurous and bought more varieties of tea from here. Apart from finds at the food market, I didn't find anything in Kyoto to buy. Generally, I felt that the place while atmospheric, was touristy and things weren't cheap at all. This I felt to be generally true of Japan as a whole, but in Kyoto it was particularly difficult to find apparel that would appeal to me in any way and even for the 'traditional' crafts like fans, pottery and screens, the really good ones are just out of my budget and the regular ones, well, they tend to collect as useless souvenirs after awhile. This is the Kamo river in Kyoto, which seperated the Geisha district of Gion, if you've read Memoirs of a Geisha, this is where Sayuri said Hatsumomo would say "Kamo River, have you met my younger sister" and push her in, if she were indeed joined to her in apprenticeship. The best part of Kyoto was probably just walking around it and I felt that Johnny Hillwalker did a good job of explaining to us the context of Kyoto. (These two photographs are a private cemetary and temple that he took us to, which his family worships at). What he explained was that indeed, Kyoto was a place of trade specialisation for particular types of crafts (food, fans, pottery, cards, knive sharpeners) and hence the gentry that could afford such products and lifestyle. These trades would take place in the humble homes of ordinary tradespeople who used the lower floors of their houses as studios and the upper floors as homes. This focus of cottage craft is one of the reasons that Kyoto is suffering from out-migration, especially of younger people, who cannot find real jobs. This has had a knock-on effect on schools and institutions as the population ages. He explained that Kyoto has always been a place of seperate worlds for the rich and the working class, though the beauty, climate and religiousity of the two helped to bind the society together. Kyoto had great temples and gardens which drew the political and business elite here from Tokyo for more 'traditional' experiences and lifestyle. Art, in different forms, including the Geisha movement, flourished here and so did religion, a mix between Buddhism and Shinto. One catered for your soul while you were alive and one took care of your afterlife. His tour didn't focus on 'grand' temples', like those you see above, rather, little workshops, like the one pictured above, where they make fruit-shaped Japanese mochi sweets. After the long tour, we were encouraged to take the grand temple tour anyway by ourselves and we walked up to the Kiyomizu Temple before returning to the Ryokan for Kaiseki dinner. Kaiseki literally means "stone in the bosom", thought to indicate the frugal meal served in the austere style of chanoyu (Japanese tea ceremony) of Zen monks. In the present day, kaiseki is a type of art form that balances the taste, texture, appearance, and colors of food. I've heard it described as Japanese haute cuisine, though I have my reservations about that idea. Fresh seasonal local ingredients are used and dishes are beautifully arranged and garnished, often with real leaves and flowers, as well as edible garnishes designed to resemble natural plants and animals. I must say that our kaiseki experience left a lot to be desired, not just because we wound up being very hungry afterward! Perhaps it is more meaningful if the proprietor explains to you in Japanese what each part of the meal is about, or if the dish has slightly more food than garnish but for us, the meal was a bit of "toe of newt and leg of fly", with what we concluded was multi-hued goo- pink goo, green goo and white goo, all of which tasted like goo/mochi/rice/yuba (steamed tofu skin). What a pity! I took pictures anyway, the slightly more memorable dishes were the very fresh chilled tuna wrapped in raw tofu skin and served with thinly sliced bamboo pith and the braised cod served with grilled crispy eel skin. Unfortunately, most of the meal just wound up feeling a bit skinny, skimpy and stingy, while at the same time being ridiculously expensive and lukewarmly bland. One of the great things about New York is how the lowliest food can become such a unifying culinary and cultural icon, something I discovered on my final day, in a day of gorging. 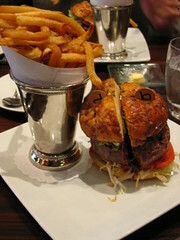 The burger is perhaps the quintessential American food, and the burgers in New York are really something else. What is most remarkable though, is how even the top restaurants and chefs have decided it's simply not feasible to eliminate the burger from their menus. 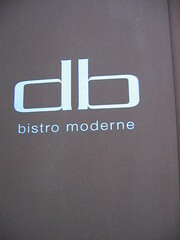 A good example is DB Bistro Moderne, one of the less formal offerings of Daniel Boulud, the successful French chef behind the two Michelin-starred restaurant Daniel. I did not, on this occasion, have the budget to sample Daniel, so I decided to try the lunchtime specials at the bistro instead. 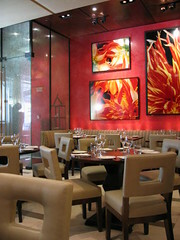 The interior of the bistro is bathed in light, which showcases the dramatic red walls and portraits of flaming flowers even more starkly, and the plush seats are extremely comfortable. One of my gripes about restaurants is that, often, when the chef is good enough to prepare a complementary amuse-bouche, this gesture is often ruined by the waitstaff who rapidly mumble what it consists of. While it is always possible to ask them to repeat themselves, often the diner is somewhat reluctant to do so, and even if he does, the waiter merely mumble it again. Sadly, despite the fact that service was excellent in all other respects, I was unable to hear what was being placed in front of me. 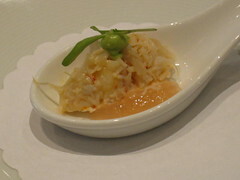 To the best of my belief, I had a crab salad served with what might have been quince jelly, and a pea-sized ball of pea or avocado mousse. Still, whatever it was, it served its purpose well - the briny, distinctive crab flavour dominated, and made me look forward to the rest of the meal. 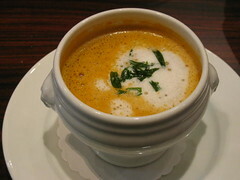 Lobster bisque is so often mutilated that it's such a treat to be able to order a good one; one that is heady and robust, packed with that warm, mouth-filling umami that is so characteristic. 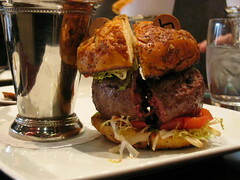 Perhaps I exaggerated, and the burger is really just standard lunch fare, and one would expect nothing less than to see it on any lunch menu. One certainly does not, however, expect this particular burger, with a patty that dwarfs the bun and makes every other burger look like nothing more than a round sandwich. The db Burger boasts a patty made of pure ground sirloin, stuffed with braised beef shortribs, foie gras and truffles (because it's not at all excessive), maximising flavour without compromising on juiciness. In fact, the patty is so saturated that it just oozes juices of its own accord, which made for some very messy eating as the lower bun began disintegrating. I really can't do justice to this burger in words. It is a wonderful thing that must be sampled to be believed. Apparently, the recipe is even too complicated for it to be revealed in public, but you can find a reasonable (and humorous) facsimile here. And yet burgers are the ultimate snack food, they are the emblem of the fast food chains and globalisation in general. New Yorkers, it seems, have a special affinity for burgers. There are dedicated burger joints all over the place; boasting that they offer the true New York burger, or the best burger in New York. While I haven't exactly tried every single burger in New York, the general consensus seems to be that the best burger in this City, without a doubt, is the Shake Shack burger. Situated in the middle of nowhere, this place pulls crowds from all over the city, and if you come at the wrong time you could be stuck in line for quite a long while. Thankfully I was there for tea (if a burger could count as tea), because I had heard all about the Shake Shack and wanted to try it first hand. It's quite an easy system; you place your order and you're given this device that resembles a cattle prod. When your order is ready, the cattle prod vibrates, letting you know to go collect your goodies. And wow are they goodies! 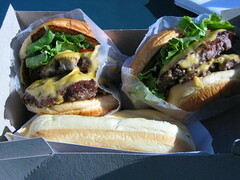 I don't know what Shake Shack does to their burgers, but they really taste amazing. I had another cheap burger for dinner one night, and there was just no comparison. The Shack burger was warm, juicy, flavoursome, and savoury. The melted cheese oozed off the double patties in messy, dairy goodness. The vegetables were fresh and crisp. By far and away the best snack burger I've had in a long time, despite regularly dining at GBK back in Oxford. 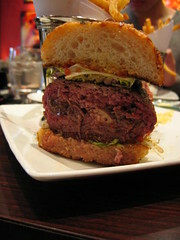 There's an inevitable comparison to the DB burger; but I think that's a bit of an unfair test. They both appeal on different levels to different budgets and different frames of mind. I suppose if you really only had time for one burger in New York, this would have to be it, assuming you'd rather go to Daniel's for "posher" fare. 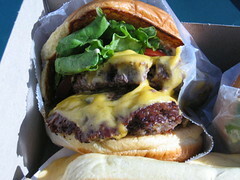 It's true that the Shack burger is not very big; but that just leaves space for more burgers. 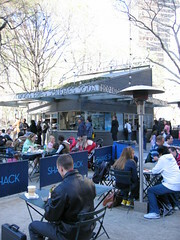 Shake Shack also does other foods that are bad for you but you can't resist, like hot dogs and milkshakes.